Our designers explored a collection of signs and structures such as show house identifier signs, garden identifier signs, clock tower, precinct markers, etc., to enhance the quality of the landscape. The show house and garden identifier signs were fabricated and installed but the rest were aborted due to the economic recession of 2008. One needs to feel through the five senses the essence of the place and how these characteristics can be expressed through design. The original proposal the for clock tower in front of the security guardhouse / entrance was a traditional Malay structure. However the client felt it was out of place among the modern setting and we were asked to present an alternative. Our solution was a sleek clock tower that displays the time in key capital cities. This approach supports the aspiration of the brand as the clock tower immediately communicates to visitors that East Ledang values and celebrates a community that is international. A minimal design fits better with the modern residences of East Ledang. The Crescent moon is in chrome gold and is illuminated at night. The stars are animated using LEDs, changing their configurations to match various star formations. Sculptures and installation art were designed for some of the 31 mood gardens, based on forms found in the natural world. Silhouettes of fauna and flora in cut-out aluminium move and dance with the wind. A leaf-shaped signage system was explored on the computer. Design for the boundary wall next to the main entrance to the development. A combination of gold and frosted glass lent an exclusive feel to the development. 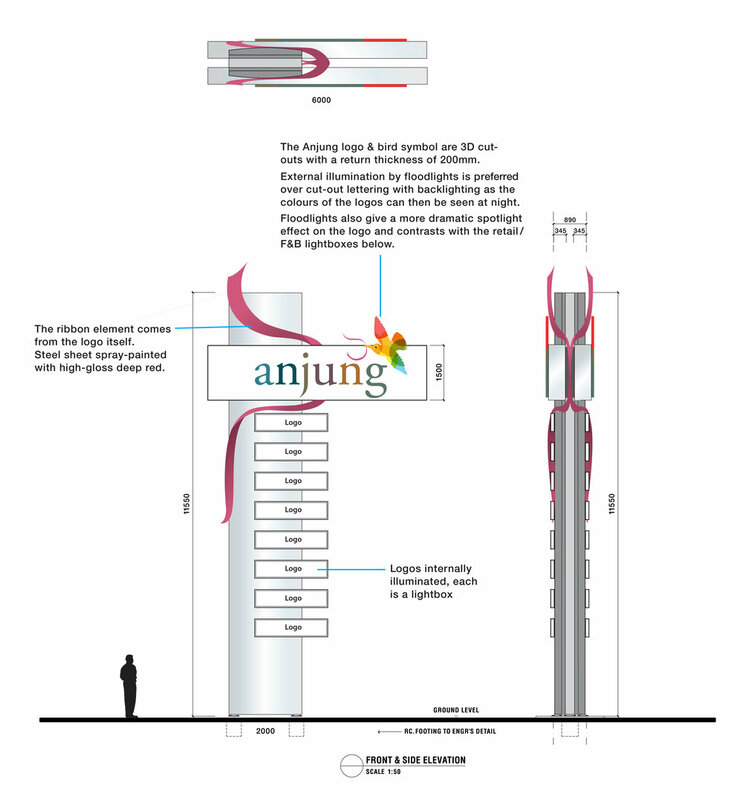 We were working concurrently on the logo and signage for Anjung, the small neighbourhood retail centre being built for the convenience of East Ledang’s residents. (Nusajaya is a new city with a sparse population and at the time there were no other retail shops in the vicinity). The logo of the bird with the ribbon came from the idea that one would leave the nest and return from Anjung with food, grocery, etc. Anjung is a fairly small, open retail space—the food court, supermarket and restaurant area can be easily seen on arrival. Therefore, Anjung will need only a basic number of signs, the most important being the direction to the toilets. When the architectural layout is intuitive, one can do less with signs, reducing costs and eliminating redundancy. Early in the project we had designed signboards for some key areas but they were not implemented as we decided they were decorative and did not serve any wayfinding function (budget was also limited).